Which smart plug is worthy of your cash? They might not grab the headlines like some other bits of smart home kit, but smart plugs are wonderful little devices, letting you add some remote app control to any dumb device that plugs into a power socket – you can add them for lamps, fans, heaters, and so on. Here we're going to match up two of the very best and most popular smart plugs: the Belkin WeMo Switch and the TP-Link Kasa (HS110). Want to know the differences between them and which one will fit most suitably into your home setup? Read on to find out. How about a smart thermostat to go along with your smart plug? What does a smart plug need to be, design-wise? It needs to be as discreet and as compact as possible, able to do its job without extending halfway into your living room or across the kitchen table. It basically needs to look as aesthetically pleasing as it can, blending into the background behind your other gadgets. With that in mind we're pleased to report that both the Belkin WeMo Insight Switch and the TP-Link Kasa Smart Plug fit the bill in terms of design. The Belkin device is nicely curved and appropriately minimalistic, with a single power switch and status indicator on the top. It extends 5.8 cm (2.3 inches) into the room, so you should be able to fit all of your other gadgetry around it, and use it in pretty much any power socket in the home. Meanwhile, the TP-Link Kasa Smart Plug (also sometimes labelled as the HS110) is quite a looker as well – rounded, simple and white, again with a power switch and status light on the top of the plug. We reckon it's actually a little bit better in appearance than the Belkin plug. It extends a little further into the room at 6.6 cm (2.6 inches), but not by much. The good news when it comes to choosing smart plugs is that you don't have to stress too much about poring over specs lists – there just aren't that many specs to worry about. You can control the switching on and switching off of the plug remotely through your phone, and that's about it, and the Belkin and TP-Link plugs do the job perfectly well. Overall, the Belkin WeMo Insight Switch is the more compact and lighter of the two plugs at 7.4 cm x 7.4 cm x 5.8 cm (2.9 inches x 2.9 inches x 2.3 inches), weighing in at 80.5 grams (2.84 ounces). Through the app, you can switch it on and off manually, set it to switch on and off via a schedule, and check how much energy the plug is using too. The TP-Link Kasa Smart Plug measures 10 cm x 7.7 cm x 6.6 cm (3.9 inches x 3 inches x 2.6 inches) and tips the scales at 131.8 grams (4.6 ounces). The app controls are mostly exactly the same as the Belkin – manual or scheduled operation, with built-in energy reports – but there is the added option of setting the plug to turn off based on a countdown timer. There are a few more features to talk about with these smart plugs, including the way they can integrate into the rest of your smart home system. The TP-Link Kasa (HS110) plug supports Amazon Alexa, Google Assistant, Microsoft Cortana, IFTTT (If This Then That) and the Works with Nest standard from Google, so you've got plenty of options. As for the Belkin WeMo Insight Switch, it also works with Amazon Alexa, Google Assistant, IFTTT and Works with Nest, though for the moment there's no support for Microsoft Cortana. Unlike the TP-Link plug, you can get this Belkin device working with Apple's HomeKit system, though you do need to buy a separate WeMo Bridge device from Belkin to plug directly into your router. Both the Belkin WeMo Insight Switch and the TP-Link Kasa Smart Plug have Android and iOS apps available, as you would expect, so no matter what mobile operating system you've got on your phone or tablet, you can operate these plugs. If your Wi-Fi goes down, you can use the switches on the plugs themselves to operate them. The smart plug is one of the simpler smart home devices out there, and that means fewer distinctions between different models from different manufacturers – most of the smart plugs you'll come across do the basics of letting you turn sockets on and off remotely, or via a schedule if needed. Belkin certainly has more smart home kit available right now than TP-Link, though TP-Link does offer smart lighting solutions, which Belkin doesn't have at the moment. 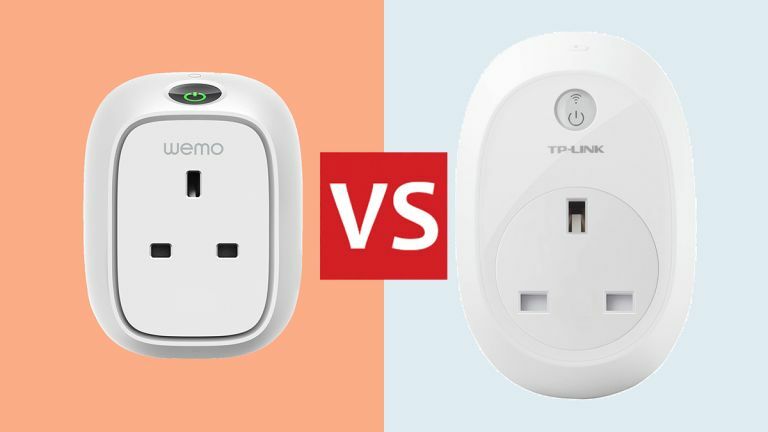 It's worth weighing up what other smart home devices you've got installed (or plan to buy) when you're choosing between these two smart plugs. In the end though the Belkin WeMo Insight Switch and the TP-Link Kasa Smart Plug are hard to split – both do a very good job of letting you automate your plug sockets, both have intuitive and simple-to-use apps, and both include energy monitoring reports for individual plugs. They're both very affordable too.